Buy Fresh Buy Local, The Horn Farm and Healthy World Cafe are joining together for a street dinner in York! 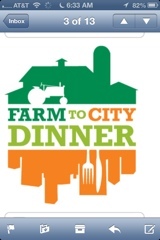 Food from local farms will be gathered, cooked up and served at this fun event! The chefs from Healthy World Cafe are creative and make some delicious goodies! Join us! Tickets are $65 each, contact yorkbfbl@yahoo.com for more information.